Close on the heels of Prashant Bhushan slamming the Government and the main opposition party, Congress, over consideration of former CBDT chief K V Chowdary as the next Chief Vigilance Commissioner, eminent jurist, former Union Law Minister and senior advocate at the Supreme Court, Ram Jethmalani has also come out in the open and taken exception to the proposed appointment of K V Chowdary as the next Chief Vigilance Commissioner. In a strongly worded letter addressed to President Pranab Mukherjee on June 2, 2015, Mr. Jethmalani has termed the consideration of KV Chowdary’s name for the post of CVC as the “greatest disaster that will fall on this unfortunate nation”. Pointing out that in a letter addressed to the Prime Minister on 26.05.2015 he had opposed the consideration of KV Chowdary for the post of Chief Vigilance Commissioner, Mr. Jethmalani has expressed shock at what the Prime Minister is proposing to do to his electoral promise of eradicating corruption on the basis of the advice of the Finance Minister. Stating that he was writing the letter in a state of great mental excitement, Mr. Jethmalani has also accused Prime Minister Modi of being unable to control corrupt and anti-national elements. Additionally, Mr. Jethmalani has requested the President to hear him out on the issue before confirming KV Chowdary’s appointment, and to postpone the action of the Government in the meantime. In his letter of May 26, addressed to the Prime Minister, Mr. Jethmalani had vented his ire at Finance Minister Arun Jaitley and accused him of having no interest whatsoever in the identification and punishment of powerful offenders or repatriation of proceeds of their crimes. 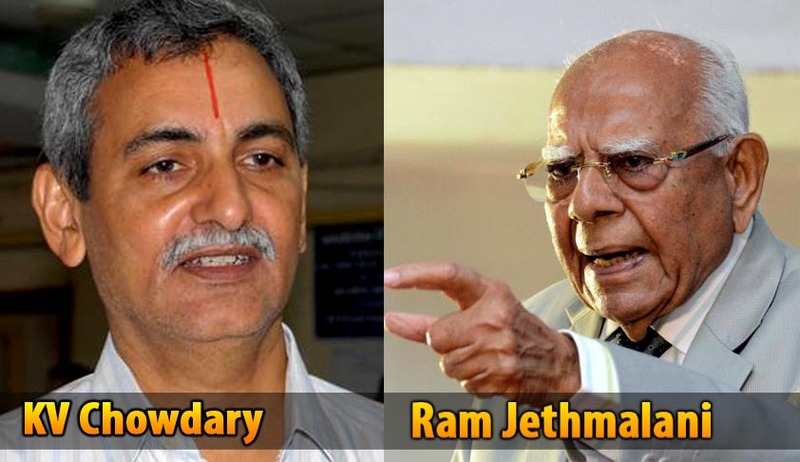 Mr. Jethmalani had also objected to the act of the Finance Minister in proposing the name of KV Chowdary for the post of CVC, whom Mr. Jethmalani has accused of having “by no means a clean record”. He had said in this letter that KV Chowdary is closely associated with former Finance Minister P Chidambaram, who has sought to wholly frustrate the achievement of objects dear to Prime Minister Modi. Earlier, Mr. Prashant Bhushan had taken to Twitter and alleged that there is a consensus between both Bharatiya Janata Party and Congress to “destroy” CVC by “appointing a dubious and pliable person as its chief”. Mr. Bhushan’s outburst followed after news reports emerged to the effect that KV Chowdary’s name was cleared in a meeting attended by Prime Minister Narendra Modi, Union Home Minister Rajnath Singh and leader of largest opposition party in Lok Sabha, Mallikarjun Kharge. Though there has been no official confirmation as yet, 61-year-old Chowdary is believed to be the top contender for the post of CVC. Chowdary, who retired as CBDT chief in October last year, has been working as adviser to Supreme Court appointed Special Investigation Team, that is probing black money cases. Read the full text of letter here.